PASADENA, CA--(Marketwired - October 14, 2013) - TouchShare (formerly known as TouchTable, Inc.), the leader in next-generation geospatial collaboration solutions, today announced TouchShare Mobile Access which extends the company's multi-touch solutions for rich, immersive geospatial collaboration to anyone, regardless of location or device. The company also announced a new CEO and brand identity, and previewed several new technologies that are defining the future of collaboration. 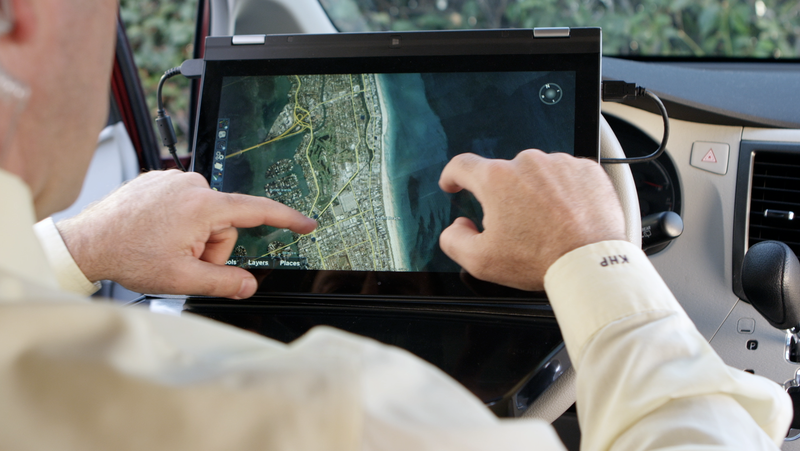 To accelerate understanding of complex information, the new TouchShare Mobile Access significantly improves team-wide productivity as it gives all collaborators the ability to simultaneously view and contribute to what other team members are seeing in real-time and interact with rich, visual geospatial information (live data, 2D imagery, video, etc.) via any device. This allows all participants to easily and quickly see the "big picture" for making better decisions faster. "Effective collaboration should involve all your people and tap into all your senses," said Bob Pette, TouchShare CEO. "With the exponential growth in volume and variety of data, we're surrounded by information yet starving for insights. TouchShare addresses this challenge by giving everyone the ability to filter and fuse the 'right' data to make the 'right' decision so teams can more quickly determine a plan of action." TouchShare introduced a new company name, logo, tagline and website (www.touchshare.com) designed to better define and distinguish a brand that is already recognized as the leader in multi-touch geospatial collaboration solutions. Its tagline, "Decisions In Sight," captures the company's ability to integrate various, discrete data inputs, with anytime-anywhere visualization to enable real-time shared insights. In addition, Bob Pette, former CEO/COO of Perceptive Pixel, was appointed as TouchShare CEO. Mr. Pette joins at a time when the importance of effective collaboration in the face of rapidly expanding data streams is recognized as not only critical in managing crises, but also key to an organization's daily productivity. Previously, Mr. Pette served as vice president, Professional Solutions Group at NVDIA, and vice president of visualization at Silicon Graphics. "As the most experienced company in cognitive collaboration, TouchShare brings together the best of Big Data Analytics, Visualization, Mobility, Man-Machine Interaction, and Secure Communication to offer the TouchShare collaboration system," said Bob Pette. "The result is a profoundly transformative technology that not only accelerates high quality decisions and lowers the cost of collaboration, but also has a long lasting positive impact on productivity and team effectiveness." TouchShare revealed a few details on upcoming products that will define how teams will collaborate in the future. More details will be available shortly. Rich 3D Geospatial Collaboration Platform - a 3D geospatial collaboration platform (codenamed Buckeye) that is able to converge disparate open data sources. Its innovative 3D terrain renderer enables unique visualization and analysis of geospatial workflows with pinpoint accuracy through a variety of tools, such as lensing and data layering. iOS Content Exchange - Support for the iOS environment will let anyone -- whether in the office or in the field -- easily send, retrieve and store content (photos, maps, video, etc.) that is optimized for their device (iPad, iPhone), so they have the "right" information at the "right" time, anywhere they need to be. Large Format Multi-Touch Systems - TouchShare will continue its focus on premium, multi-touch displays, including Quad HD, in partnership with leading providers. Since launching in 2006, more than 350 TouchTable systems have been installed and thousands of TouchShare® licenses deployed among customers in a range of markets, including American Red Cross, U.S. Department of Defense and various intelligence agencies. TouchShare, Inc. designs, develops and integrates the industry's leading geospatial collaboration solutions that enable teams to visualize, interact, manipulate, and share data from any device, anywhere, to bring clarity to complex situations. With customers in the Defense and Intelligence, Energy, Public Safety, Homeland Security, Telecommunications and Health and Human Services fields, the TouchShare family of products provides a rich environment for collaboration through intuitive interactivity, high definition 3D visualization, and data fusion. TouchShare is headquartered in Pasadena, California. Learn more at http://www.touchshare.com or info@touchshare.com.